In Japan, scientists enjoy a celebrity status much like a sports hero or rock star. Their achievements evoke national pride, thus their pictures grace billboards and t-shirts and their appearances at public venues cause a stir. Scientists in the West have been so summarily dismissed for their inconvenient truths that I felt compelled to impart a little celebrity idolatry to the British scientist, James Lovelock during his recent book tour. Catherine had already bought a copy of his latest book "The Revenge of Gaia". This was the man who came up with the Gaia hypothesis, which states, in short, that the earth is a living, self-regulating organism and not a dead rock upon which life clings. This view of the earth was considered controversial in the scientific world, given its anthropomorphic flavor. James Lovelock is now rattling the cages of environmentalists by coming out in favor of nuclear power. His opinion is not easily discounted, because he was the man who convinced the scientific community that the ozone hole was indeed a threat and that governments should ban ozone-destroying CFCs. In a recent article on the issues of global warming, Lovelock stated that he would happily offer his own backyard for the storage of nuclear waste if that's what it would take to convince the public to support the building of nuclear power plants, so adamantly did he feel that the waste was of little consequence next to the dire need for emission free power. Nor would it take up much space. Though I agreed with him that the situation was dire, I was far from convinced that nuclear power was as benign as he claimed. I was curious to see how he would present his case. We made an outing of it with our friend Dave. Our quest led us to a packed auditorium in the bowels of Stanford University. The 87-year-old scientist, trained in chemistry, cut a mild mannered figure as he calmly read his paper on the impending desertification of the planet. This was not the first time the planet would experience a devastating global warming, he told us. 55 million years ago such an occurrence did happen when up to 3.0 terratons of carbon were released into the atmosphere due to a geological event that is still under debate, but might have been prompted by a subterranean volcano. It took another 100,000 years for the earth to recover its lush green coolness. There is something about history repeating itself that seems curiously inevitable. If it happened before, it can certainly happen again and according to Lovelock's forecast, it will take us about 40 years to add enough carbon dioxide to the atmosphere to cause the ice on Greenland to melt, algae in the too warm ocean to stop growing and the tropical forests to dehydrate. All of this "positive feedback" would quickly create a planet so barren of life that only the most northern and most southern parts would be habitable. To aid us in visualizing this predicament a series of three maps were projected onto the screen. One showed the earth as it is now. One of it at -5C cooler than today when there were no deserts, and one at 5C warmer than it is now where virtually all of the continents are desert save for the very tip of south America and a strip that spanned northern Canada, all of England, northern Europe, Russia and China. We all gazed at this strip of habitable earth and wondered where we might buy viable real estate to see us through the next 100,000 years. It stretches the mind to accept such a fate and not all those present were ready to. Despite the intelligent questions of many young people in the audience, there was one middle-aged man who challenged the evening's presentation for being one sided. Where was the other perspective he wanted to know? The one that said this wasn't happening. James Lovelock grasped the man's desire for a TV style debate and pointed out that this was not a matter of debating different interpretations such as lawyers would do in a court of law. This is nature's law unfolding in response to scientifically observed phenomena. The discussion was now about how soon and how fast. Someone else asked if he had seen "An Inconvenient Truth". He had not, but he had reviewed the book of the movie and had found the science to be accurate. He just felt that Al Gore hadn't gone far enough. No one thought to ask how far he should have gone. And if Gore had gone further, I thought, he would have lost half his audience. There is a limit to how much we can take in at one sitting. In the days following James Lovelock's presentation I did not want to think much about his forecast, but I felt changed in my perceptions of global warming. It is useful to go to the extreme end of an issue, if only to confirm that the more moderate perspectives were indeed viable. 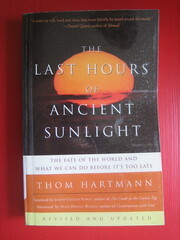 He had not discussed nuclear power in his lecture, so I decided to read his book. In it he writes extensively of our fear of all things nuclear, our fear of cancer and our overreaction to the use of synthetic fertilizers and pesticides. The significant causes of the devastation of Gaia, as he calls the earth, are combustion, cattle and chainsaws or the burning of fossil fuels, too much manure silting up waterways and deforestation. To see the world as James Lovelock does, it is helpful to evoke the photograph of earth from space and imagine sitting at the bedside of our ailing planet as she undergoes this fever we call global warming. Looking at the earth in all its beautiful blueness we cannot see all the humans on it anymore than we can see cells in a human being. 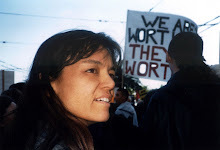 And in treating this planetary fever, we must consider the earth as a whole and not necessarily the individual cells. It is from this perspective that Lovelock justifies nuclear power. For nuclear power is not harmful to the earth. This was stunning news. I had thought that nuclear waste would devastate all living things, but apparently this was just our human centric projection. Plant life seems to thrive where nuclear waste has been leaked. Here he shows a picture of Par Pond, a waste repository outside of the Savannah River Nuclear Facility in the US and it is indeed lush with growth. As for wildlife, their lives might be shortened by a week or two, but it was a small price to pay for keeping the earth itself alive. He did not mention how the animals would die, but he did attribute the main cause of cancer to be a by-product of our breathing of oxygen. Now I was really caught off guard. This I had never heard, but apparently our own combustion process, when the oxygen we breathe combines with the food we eat, creates pollution. If the cell doesn't manage to neutralize this pollution, as once in a while it doesn't, then we have a renegade cell that reproduces unchecked. So the 30 percent of humans who will die of cancer are not all being poisoned by our industrial toxins, but are reacting to oxygen, something we can't live without. I felt as though all that I had believed about the dangers of toxins and radiation had been largely propagated by media hype and I had been duped. Yet if I started to talk about how nuclear power was not nearly as dangerous as perceived, I sounded like a Republican. And yes nuclear radiation, whether man made or naturally occurring, can cause cancer, but not enough to add significantly to the 30 percent cited above, he claimed. A hydroelectric-generating damn that burst would devastate many more lives, given that so many would be killed instantly, than did Chernobyl failing, in which only 75 people died (those who directly fought the fire or cleaned up afterwards.) Speculation of deaths related to exposure to the radiation was just that - speculation. Considering that all of us alive have been exposed and continue to be exposed, worldwide, to radiation from the underground testing of nuclear bombs, what's a little more radiation? We are having this conversation because of civilization's need for electricity. And on this topic Lovelock has more news. Wind power, that silver bullet of the environmental movement, could quickly be made obsolete by the changing climate and the redirection of the wind itself. We could use our remaining fossil fuel to build windmills and litter the landscape with this giant hardware, only to find that the direction of the wind has changed or is non-existent. We would be caught like sailors in the doldrums. And solar was too expensive, he stated, but I will not concede him that claim, having installed solar panels on my own house. James Lovelock's big picture of the planet leads him to prescribe big picture solutions, thus his plea for nuclear power. And though he has changed my mind about the dangers of nuclear power (when used properly and not sabotaged by terrorists or nations wishing to drop bombs) I am not willing to embrace nuclear power because I am not for centralized power in the first place. Centralized anything does not inspire my imagination. I would rather we invented hand crank, battery operated toasters and rethink civilization, not as something that needed a steady feeding of electricity, but as something that could remake itself in an imaginative Leonardo De Vinci sort of way. James Lovelock claims that we do not have time. The centralized civilization that we are will continue to pollute carbon dioxide from fossil fuel burning plants unless given a viable emission free substitute. He has described the outcome of our continuing to add emissions to the atmosphere - a planetary die off of 80% and a two-thirds uninhabitable planet. 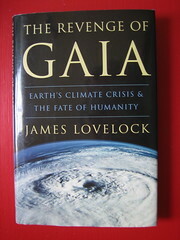 As a scientist, James Lovelock doesn't go in for the cultural or lifestyle change that other solution oriented authors suggest we undergo in order to solve this planetary crisis, but it is useful to look through the lens of his perspective in order to see the hard reality of what we're really up against and how our idealism and fears get in the way. This living in the shadow of planetary disaster is, to me, the metaphysical test of our time. If we do nothing, disaster will most certainly befall us. And it may, anyway, even if we do, but the process of facing it squarely will enlighten us. Or as James Lovelock put it in his interview with Terry Gros, "I am optimistic about the 20% that will remain." Another prominent environmentalist who has called for a second look at nuclear is the Bay Area's own Stewart Brand, founder of The Whole Earth Catalog. Mr. Brand has also been kind enough to endorse my book - an entertaining guide to nuclear power for the lay person. It's a thriller novel preseting an inside portrait of the people, the technology, the politics, and the health issues of nuclear power. (I've worked in the industry for twenty years.) Both the pros and cons are presented. (There are plenty of both). The book is available free online, and readers seem to like it judging from their homepage comments. It's hard to believe that Lovelock believes that only 75 people died from Chernobyl. Even the UN study cites 4000 (predicted), just within the FSU. There are other reports citing far more, e.g. 30-60,000; see http://www.nirs.org/press/04-11-2006/1 for a summary of the TORCH report from the Greens in the European Parliament. I also find it hard to believe that breathing oxygen causes cancer, when cancer rates vary so much all over the world, and people all over the world breathe oxygen. I wonder if Lovelock has taken into account the massive impact on global warming of building NP stations (see notes below). Then, they are supposed to last only 40 years and be decommissioned as they start becoming unsafe, but aren't. The cost of decommissioning hasn't ever really been determined. I'm glad you offered the caveat "when used properly and not sabotaged..." How do you ensure that, considering what's going on in the world? Come to the fundraiser I'm planning in Jan. or Feb.; we'll show a movie on Chernobyl and its aftereffects made by a filmmaker who grew up in Belarus. Better still, come to Russia and Ukraine with me in May. I'll take you to the radiation zone for a day and you can talk to more survivors. Amanda, I know your hand-cranked toaster is not to be taken literally, but it serves to illustrate that people have no real appreciation for the amount of energy it takes to do anything in the modern world. It would take something like ten fit people cranking pedal-powered generators absolutely full tilt for two or three minutes to brown your toast. And then they'd have to rest a while before browning the next couple of slices. After that, they'd have no oomph left for heating the skillet, cooling the fridge or powering the bulb by which to watch the eggs fry. Your dismissal of solar energy costs may be valid from the perspectives of some individuals (myself included) and some companies like FedEx and Google, but it is still true that solar electricity is hamstrung by being very expensive in comparison to conventional sources. The political difficulty of bringing about options that could help to even things out, such as carbon taxes, only adds to the fact that global production capacity of photovoltaics, while slated for good growth over the next decade, is starting from a comparatively tiny base, and so it will remain a small source of energy for some time to come. It does not matter whether 75 or 4000 or 100,000 people died because of the Chernobyl disaster. Whatever your number, invoking Chernobyl in opposition to modern nuclear energy is invalid, both because the technology of Chernobyl (quite distinct from that of modern plants) was essentially an accident waiting to happen, and because the number of deaths that will result from insufficient energy for a modern industrial society will be orders of magnitude greater. How often have you read something like "nuclear power is not the answer to global warming"? Seems I read it all the time. It's a true statement, as far as it goes, but that's only because there is no "the solution" to global warming. Any approach to the problem of global warming had better be comprehensive, including modern nuclear energy and lots of it. All very good points Steve and Carol. I did have many questions, as you mention Carol, regarding cancer clusters and all. He recommends a book by Robert Weinberg called One Renegade Cell. I'm also very curious about his claims that the biosphere is not harmed by radiation from waste. And, yes, I was speaking in jest about a hand crank toaster, but I do love it when someone actually has data to show what it would take. Ultimately even nuclear power would not be able to keep up with our demands for electricity. Maybe so, but there's not enough of anything in perpetuity when you're exploding your numbers and energy consumption on an unsustainable path to ruin. Something tells me Prof. Lewis' statement lacks context. Again, there is no "the solution", which is what the isolated Lewis quote implies. Are you familiar with Prof. Albert Bartlett's (UC Boulder, physics) lecture, "Arithmetic, Population and Energy"? I think everyone should internalize his simple message. It's available at Global Public Media for reading, listening or watching. Bartlett's lecture isn't about nuclear energy; rather, it's about what drives the need for it, which is the exponential consequences of steady growth. If you're going to have the growth (which we don't seem to have the capacity to contain), then we'd better have all the energy we can get, including massive amounts of nuclear energy because at least it's relatively benign. Hi again Amanda. I went to see what Prof Lewis had to say. He's simply laying out the nature of the energy challenge, not taking a positon on nuclear energy. Another lecture you might be interested in if you have not yet seen it is that by the late Nobelist Dr. Richard Smalley of Rice University and Buckeyball fame, "Our Energy Challenge". http://smalley.rice.edu/ (links to high and lower bandwidth versions at the top of the page). Smalley advocated a special, small tax earmarked for a solar Manhattan Project. 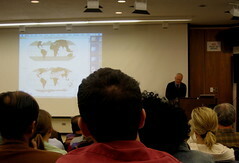 His lecture is brilliant. GCMs (global climate models) are bias toward predicting linear gradual change. If a GCM was to produce unexpected results, it wouldn't make it out of the lab. Instead, paleoclimatology evidence (for instance ice cores) show that climate change is abrupt. Forcing is at first resisted, then abruptly the climate changes from one stable state to another. It is predictable that within a decade or two the climate will abruptly change from our current mild Holocene to a more hot dry one that has resulted in mass extinctions in the past. This is what Dr Lovelock forecasts. Different components of climate change (i.e. deforestation, desertification, dying marine life, melting glaciers and permafrost) are difficult to integrate. Furthermore, positive feedback loops (i.e. melting glaciers/reflectivity, melting permafrost/greenhouse gas emissions, deforestation/droughts) are very difficult to mathematically model. My suggestion is to remove the CO2 from the air after it has been emitted. Perhaps seeding a GMO into the ocean. It is too late to reasonably reduce mankind's CO2 emissions fast enough to make a difference. Soon our only concern will be with survival because of very difficult agriculture conditions. A new specter is haunting the entire world, the specter of Gaia Nemesis. From whence this next uncanny visitor comes and what does it mean for the future of humankind? Every power of the world turns, like a herd of animals caught unawares by a predator, to face this new menace; the powers fail. They have come to face the very power of nature herself.